Can people alter weather and climate? "Countries are obliged to protect and preserve the marine environment" requires the important International Convention on the Law of the Sea, of 1982. Strict compliance would be a substantial contribution to the preservation of weather and climate. Instead, the debate on climate change is about anthropogenic emissions of carbon dioxide (CO2) into the atmosphere, which is claimed to cause significant heating of the atmosphere and thus will have lasting effects on weather and climate. The focus in the current debate is on the increase in CO2 and air temperatures and the extent of which it is due to human contribution. That is by far a too narrow minded view! � Yes, man can change the climate! 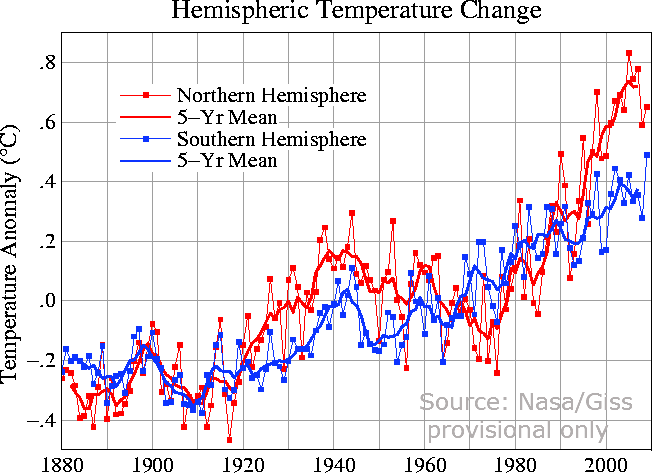 �The warming of the climate system is unequivocal. The vast majority of the observed increase in globally averaged temperatures since the mid-20th Century is very likely caused by anthropogenic greenhouse gas concentrations " (IPCC 2007). Carbon dioxide (CO2) is listed as the most important anthropogenic greenhouse gas. The effect is called "anthropogenic global warming" (AGW). This view was already expressed in the first IPCC report in 1990 and has been established in global politics for a long time. 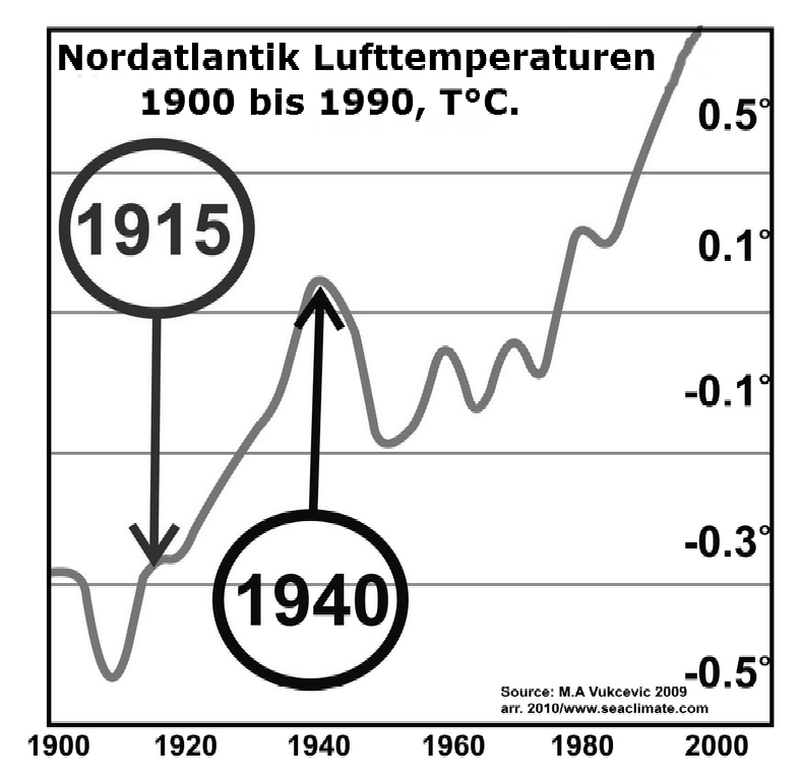 � No, man cannot change the climate! __"The increase of carbon dioxide is not responsible for the current warming." __�Political action, in the name of the 'fight against global warming' is taken and required, unnecessarily." __"The main causes of warming and cooling phases, extending over decades, can be derived from solar activity." The book recommends accepting nature as it is instead of investing large sums of money in the reduction of CO2 emissions. And what is the role of the sun? Her impact is immense. The earthly system would not work without the sun. Any change of solar activity is reflected in the air temperatures, not necessarily synonym, but always traceable with a moderate margin, presumably never big enough to initiate a climatic shift over many millions of years. The Earth's weather/climate system consists of the atmosphere, hydrosphere, biosphere and geosphere (UNFCCC, Art.1, par.3), influenced by conditions within the water volume and processed in each sphere. The medium that sustains and controls the atmospheric temperatures are the oceans and seas. They determine the region, timing and magnitude of water vapor and temperature variability. 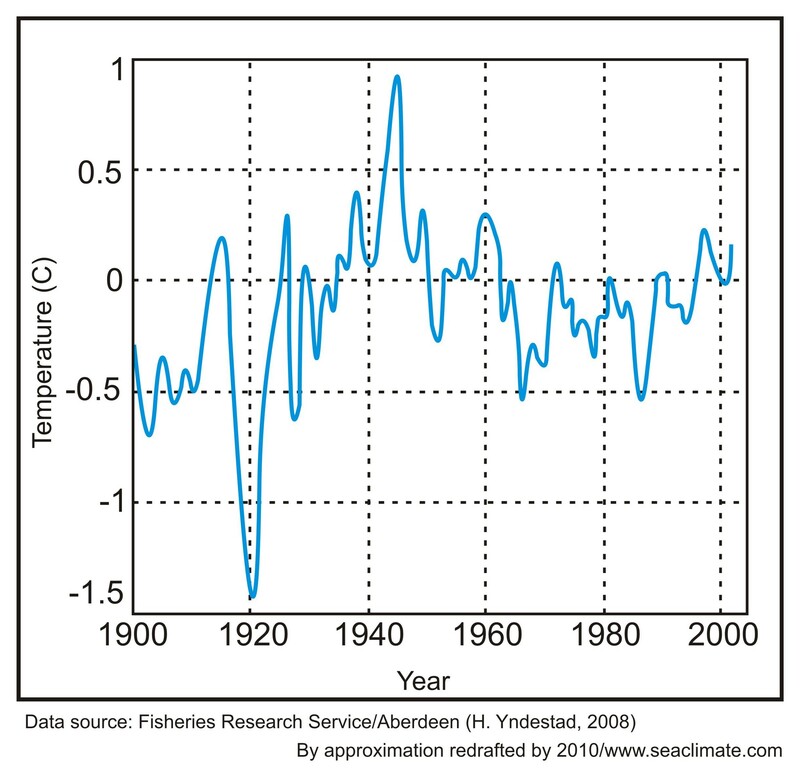 The sun is the fuel of the climatic system, but the driver is the ocean, and, with an average temperature of merely 4� Celsius, the major source of serious climate changes[*]. Oceans make climate! � My view is: The use of the ocean by man is a potential threat to the climate. Both positions have serious flaws for not caring about the anthropogenic impact in the marine environment, which has the greatest impact on the stability of weather and climate. "States have the obligation to protect and preserve the marine environment." "The climate is the continuation of oceans by other means". Since the mid-19th Century, people began to use the oceans in a much more intensive way. Shipping and fishing abandoned sails, but navigated instead with motor engines and ship propellers. 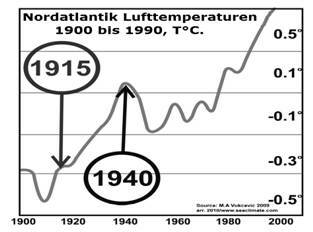 Correspondingly, over the last 150 years the Earth has warmed by about 0.7�C, with only two climatic shifts during the entire period. 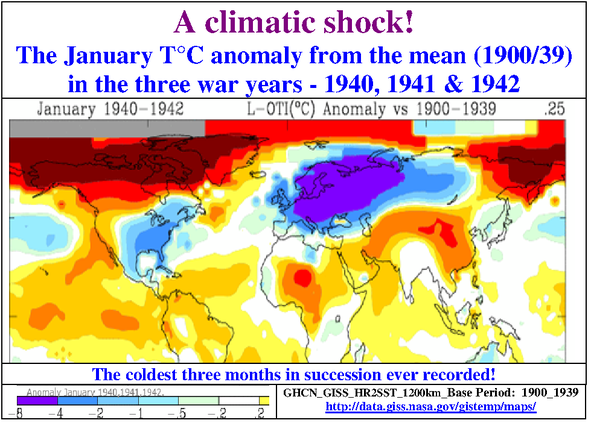 90 years ago a 20-year warming cycle began, and then the earth cooled since the first war winter 1939/40 for about three decades. Both periods stand in close correlation with the two World Wars. 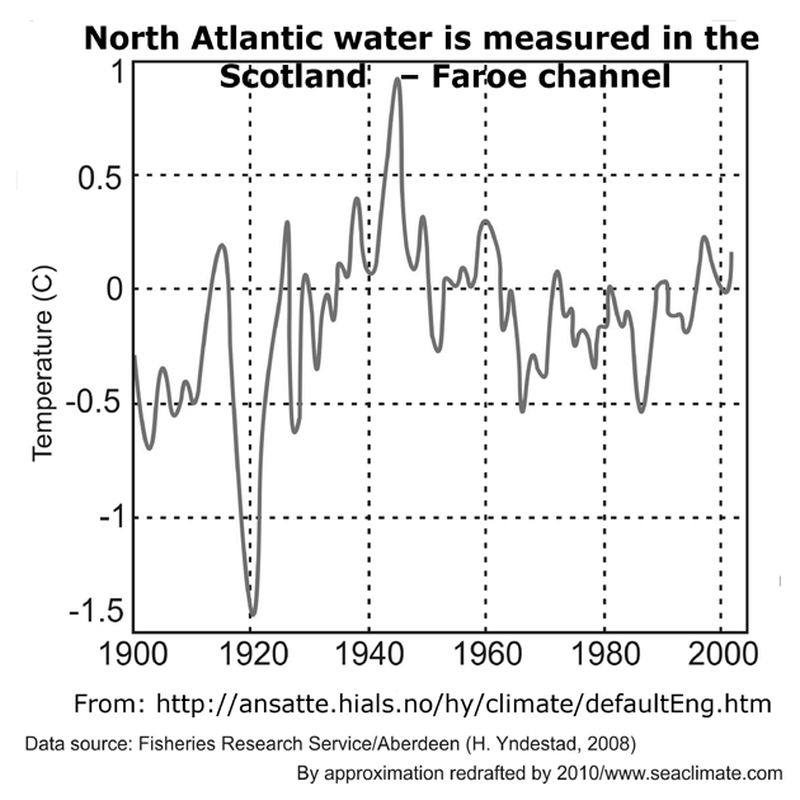 Have human activities in the marine environment anything to do with the change in regional and global temperature, without ever being noticed or investigated? b. Where do we stand today? As the first report of the International Panel on Climate Change IPCC (1990, p. 76) already wrote that the sea has an essential role in the climate system, it seems all what needed to be said, had been said. This notion was confirmed in the latest report, but again with one sentence only: "The oceans play an important role in climate variability and climate change (IPCC, 2007, page 389) This is well said and thoroughly correct, but in no way reflected in climate research. Science is still staring up into the air trying to explain the danger of climatic changes primarily as an atmospheric matter. The attention given to the role of the ocean is still by far too little. day prove to be the real threat to mankind. Already huge investments are planned, or initiated, with a high potential of being completely wrong. � "Only massive investment and a radical change of policy may yet avert the climate collapse. By 2020, the corner must be turned � that is according to information from SPIEGEL ONLINE, the alarming analysis of the IPCC. The UN experts say, what should be done. � It is about $ 16 trillion � yes you have read correctly. 16,000,000,000,000 dollars are to be set up in 2030 primarily in low-CO2 technologies, researchers at the IPCC estimated this huge sum as costs for a full stop which can still save humanity from climate collapse." For those who have no idea of what this means, they should note that the economic cost of the entire WWII have been estimated with a sum of U.S. $ 1,600,000,000,000, which is 90% less than the IPCC suggestion. This approach is breath taking, and extremely irresponsible. CO2 is, if at all, only a small player in the climatic system. c. What should we look at? Anthropogenic ocean use! Any anthropogenic climatic change concern needs to consider human intervention in the marine environment. Alterations here have the potential to influence the dynamics of the atmosphere. Ever since numerous unexpected weather and climate phenomena occurred in close timely correlation with the First and Second World War a shock should have gone through the scientific community. The aim should have been to understand the impact of human activities at sea and in the marine environment, as there are for example shipping, naval maneuvers, fishing, yachts, oil rigs and offshore wind farms. The investigation should not be limited to the current situation, but should cover the development during the last 150 years. The middle of the 19th Century marks two events, which have influenced weather and climate, ever since: The end of the Little Ice Age and the transition from sail to motor driven ships. 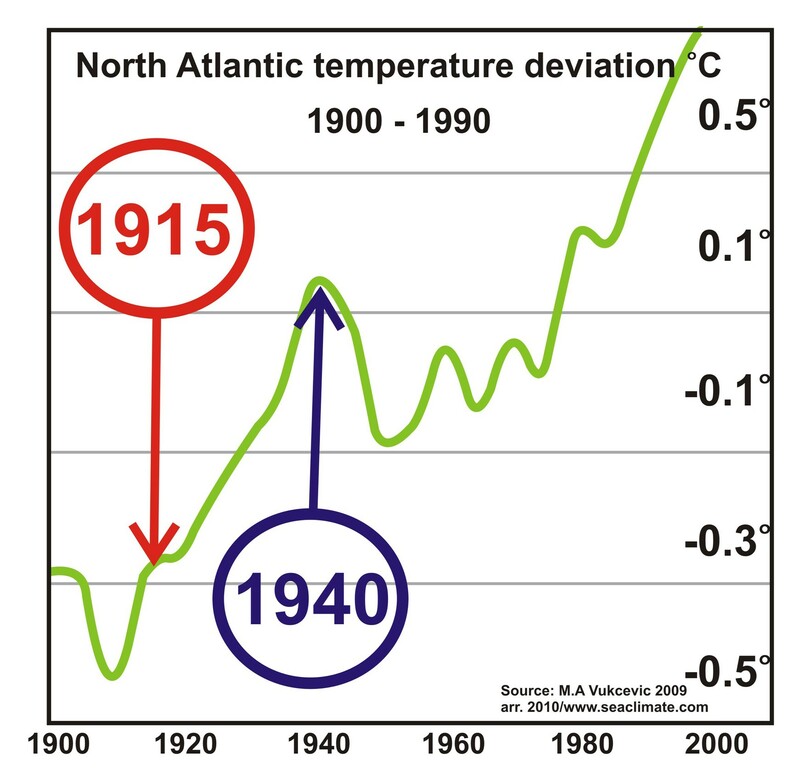 Both events have contributed to global warming during the last 150 years. Shipping and any other activity at sea could have been major factors in ocean warming processes  . Sea transport by propeller driven vessels is a very effective method to influence the sea surface structure over several meters depths. 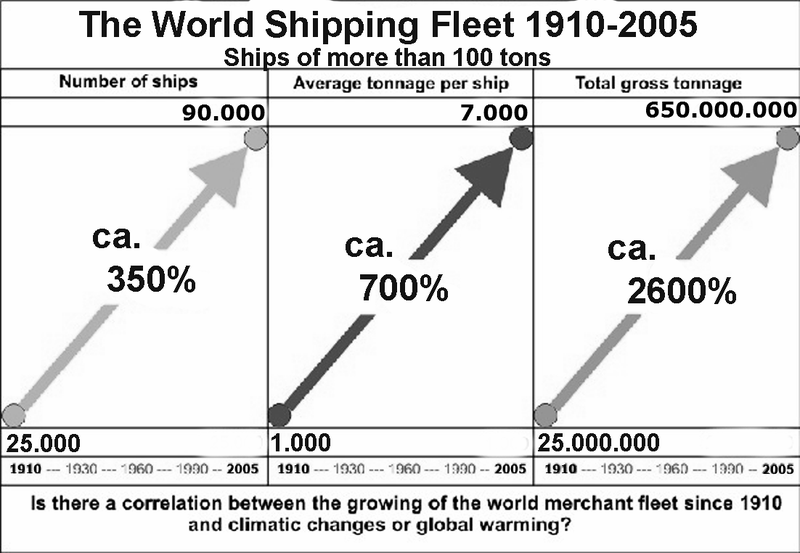 With the increase of ship traffic, the number of ships, and the size of ships, the influence has grown considerably over the years. __aa) Currently, the world merchant fleet of some 40,000 ships (ships of 1,000 tons and more), Figure A3-4. 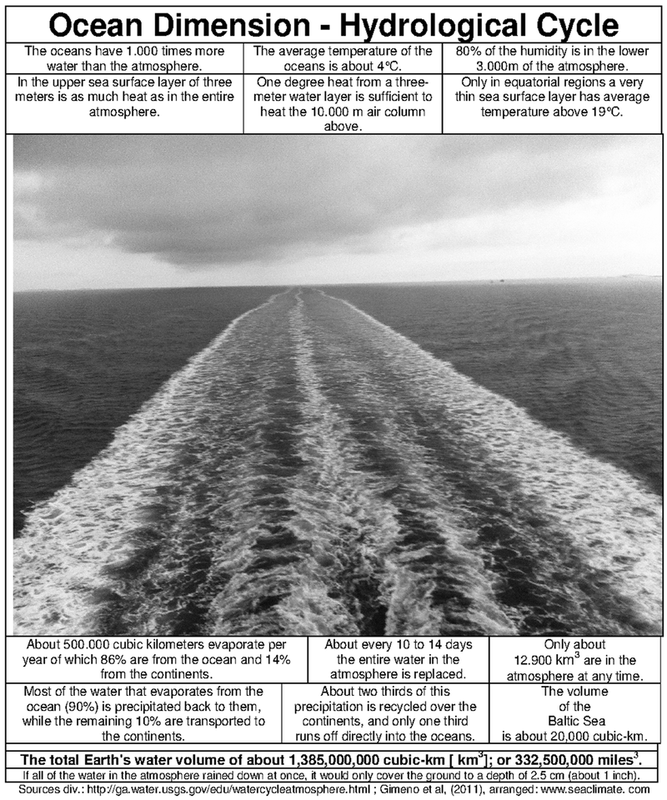 Vessels over 1,000 tons displacement have a draft between 3 to 15 meters and a speed of about 12 to 25 nautical miles per hour (22 to 45 km/h). Per day they travel a distance between 500 to 1,000 kilometers. An account of all motor and propeller-equipped boats and ships with a draft of at least one meter would result in several million units - an armada that could �churn and mix� the sea surface layer of the North Atlantic probably more than once in a year. Figure A3-5; see also Chapter G1(d): "Climate is all about water!" __bb) Before propeller driven vessels sailed the seas, there was only one external force that could cause a �mixing effect": the wind. The stronger the wind force the more mixing within the upper sea surface layer occurs. In very stormy conditions, the direct influence of the wind goes down to a maximum depth of 50 meters. The constantly enlarging ship and boat fleet over the last 150 years has a similar effect on the marine environment as the wind. Both change according to their intensity the temperature and salinity structure in the upper sea surface layer. Every day ships and boats move tens of millions of miles through a medium with highly complex physical conditions. A modern container ship covers the 6,000 kilometer distance between Rotterdam and New York in less than a week. Ships sail the seas by day and night, in summer and in winter, whether the sea is smooth or rough. Ships mix the surface layer at any time when they are at sea. The wind needs to blow at least moderately before it forms waves and influences the internal conditions of the surface layer. In winter ship wake exchanges colder surface water with warmer from lower levels, in summer it goes conversely. The list of potential consequences is probably endless, and a detailed description and analysis difficult, mainly because the science of the atmosphere, i.e. 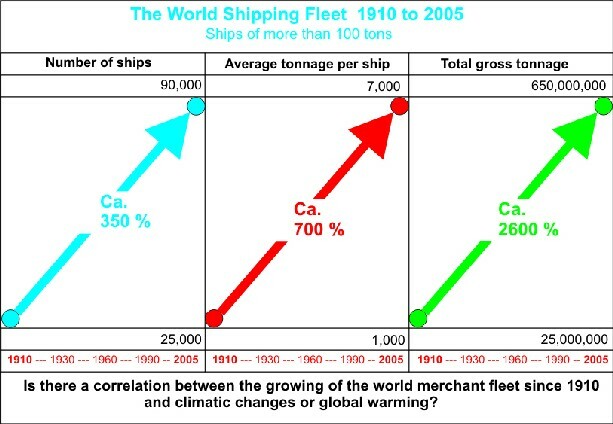 CO2, has little to say about the impact of shipping and other similar human activities on the ocean. It is even difficult to find any theses in this respect. Did science fail to examine and explain fundamental questions concerning the functioning of the climate? 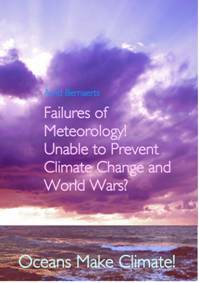 If meteorology and climatology had a thorough understanding of the impact of shipping and other ocean uses on the atmosphere, it would presumably have enabled them to explain the surprising weather excesses during the two world wars. Unfortunately, in none of the two fields science offers anything substantial. 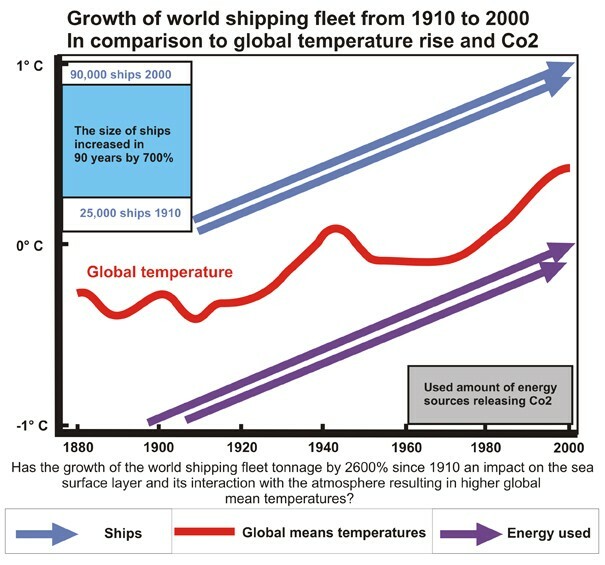 While analyzing a link between shipping and global air temperature over a time span of 150 years is too big an issue for me, the war periods are not. The sudden increase of activities at sea, offers a unique opportunity to demonstrate how effective man can influence and change atmospheric processes. 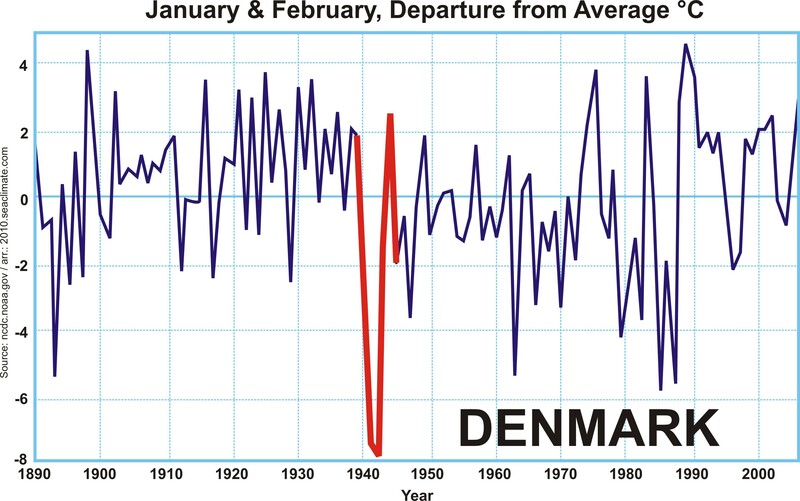 After only four months in WWII Europe was back in the Little Ice Age. The investigation benefits from the fact that the bulk of naval activities during the first 30 months took place mainly in northern European seas. In the sea areas north of the Bay of Biscay sunlight is limited during the winter months. Any mild winter air temperature for Northern Europe must come either from the Atlantic or the North Sea and Baltic. In more southern regions it would be far more difficult to define the anthropogenic influence against the sun's heat. For this reason, the Mediterranean , which still gets a lot of sunshine during the winter season, and where considerable naval warfare took place as well, is not considered in this study. The investigation benefits also from the fact that the war started at the end of the summer season when the storage of heat in the sea areas in Northern Europe is completed, and the process reversed. The stored heat is released into the atmosphere. 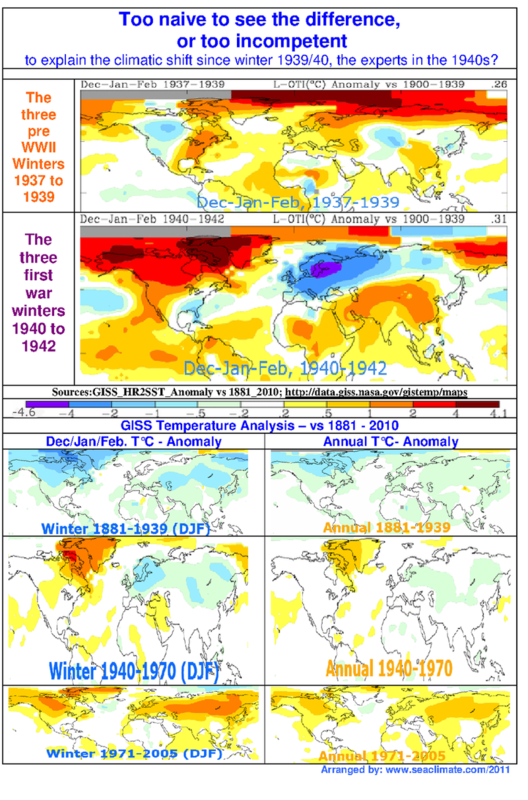 � It was the coldest winter in Central Europe (including Berlin , Prague , Warsaw ), in over 110 years. � The outbreak of winter was totally unexpected and surprising. � War and naval activities interfered with the "natural course of things", i.e., any comparison starts at the baseline (statistical average). A few months later, it must be assumed that the war has already brought alterations to both, the atmosphere and the sea. A3-7; Yndestad, H., Turrell, W.R. and Ozhigin, V. (2008). ___The abrupt climate change at the end of the First World War, which led to a warming of the winter in the northern hemisphere, a warm period that lasted until 1940. ------with the naval war in the western Pacific (1942-45). (b) significant, meaning a contribution of more than 5%). relevant (> 99%), significant (> 75%). relevant (> 90%), significant (> 50). 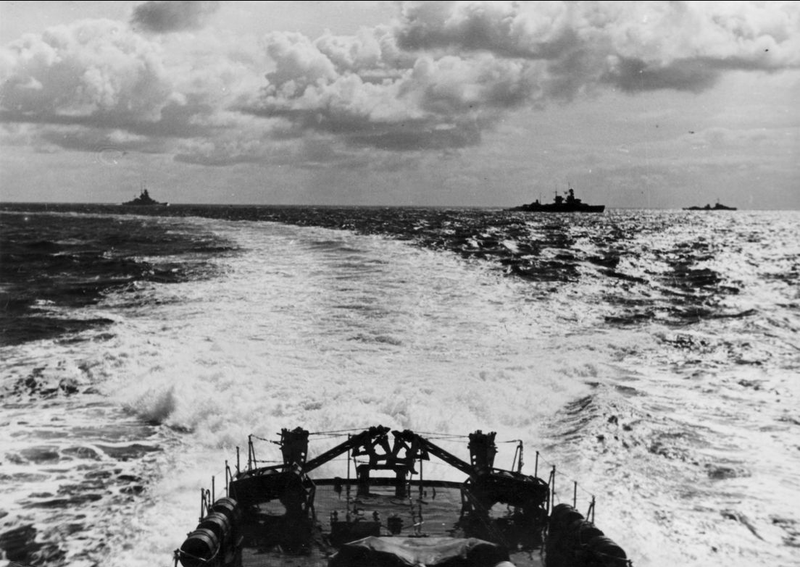 In order to clarify the interconnection between the three war winters 1940-1942 and the long-term events, it is necessary to establish the fact that the naval war contributed to the severity of the war winters. However, if there is sufficient proof in this respect, there would be no excuse for not considering the impact of naval war on long-term climatic changes. It would be highly irresponsible to neglect that. As I mentioned earlier, it is unfortunate that science is not capable of providing a full picture of the impact of man�s activities at sea, and thus undermines the objectives of international agreements to protect the marine environment, which simultaneously means: protecting the climate from changes caused by man. e. Comments concerning the terms "weather" and "climate"
The book will use the terms "weather" and "climate" as they are currently used in science, but wants to make it utterly clear that it is done with considerable outrage. 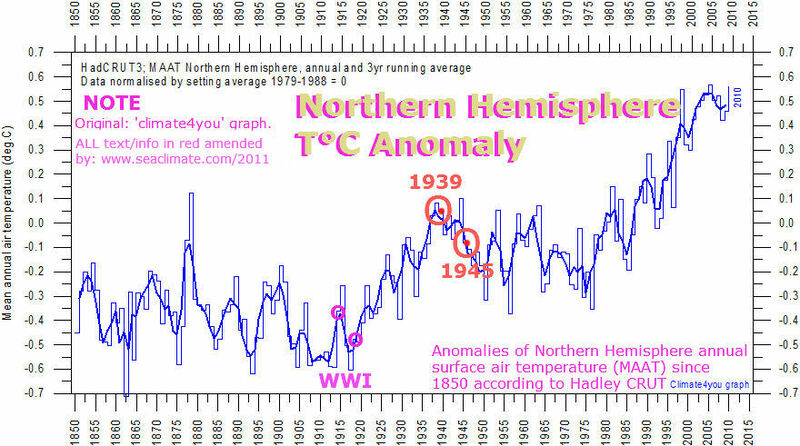 The scientific community is not able or willing to provide proper definitions, but is merely using the layman�s explanation: climate is �average weather�. This definition �must surely be regarded as quite inadequate� was the verdict of H.H. Lamp, founder of the Climatic Research Unit in 1972 in the School of Environmental Sciences at the University of East Anglia, back in 1969 (Lamp, 1969). which means, in particular, the heat and water supply to the atmosphere. may serve the purpose of this investigation. They have been chosen with care, but were not necessarily cross checked, and presented in a way to be understood by a wide general readership. Special scientific literature, and information, closely related to the thesis are referred to with standard reference, author and year, with the reference details in the List of References (pp. 203-210). Footnotes are used when deemed helpful that the information is immediately available, and particularly by internet links, but not in all cases.